An optimists view of Michigan's 24-17 loss to Notre Dame. Look, I get it. It was a long offseason. For hopeful Michigan fans, it was nine months of "Shea to the rescue", and revamped offensive coaching staff, and it appeared everyone on the roster had beefed up. If you're a subscriber to the pay sites, you heard a lot about how the improvements that were made on offense and how the OL is coming together and the receivers are all getting better and Karan Higdon is a beast now. And then Michigan had to play a football game. Not just any game...on the road, at night, against a ranked opponent...a rival, even. Kryptonite, basically, for this Michigan program that has struggled so much in games like that. All offseason is was just assumed that Michigan's elite defense was just going to continue to be elite. However, for the first half of this game, they were anything but. Down 14-0 midway through the first quarter after Notre Dame's opening two drives which both featured passes that should've been picked off and a targeting penalty that got SS Josh Metellus ejected from the game, it was the defense that suddenly looked lost and out of sync. Michigan's two opening drives stalled and resulted in punts, despite solid QB play from Patterson...there was just too little time for him to let anything develop. Notre Dame's pass rush simply overwhelmed Michigan's inexperienced offensive line. If you look at the stat sheet, Michigan and Notre Dame ended up pretty even in most meaningful categories. The difference was Notre Dame caught a lot of good breaks in the first quarter, and the bulk of Michigan's mistakes occurred then as well. Spotting a team like that 14 quick points in their home stadium at night was just too much for this Michigan team to be able to overcome. The difference in this game really came down to mental mistakes. Michigan shot themselves in the foot multiple times with bad penalties on defense that kept ND drives alive. Michigan had 2 defensive holding penalties, 2 personal fouls and a controversial roughing the passer on Chase Winovich. All in all, 42 yards of penalties on just the defense alone in the first half. To me, and probably all of you, it just seemed like Michigan was trying too hard defensively. The pass rush was intense, but almost to the point where Gary and Winovich would just run themselves out of the play, opening up big holes for Wimbush to scramble out of. In the second half, Michigan settled down defensively and it showed. Michigan was much better at containing Wimbush who led the Irish to only 69 total yards and 3 points in the second half. The only real gaff Michigan had defensively in the second half was on Notre Dame's 3rd and 18 midway through the 3rd quarter. 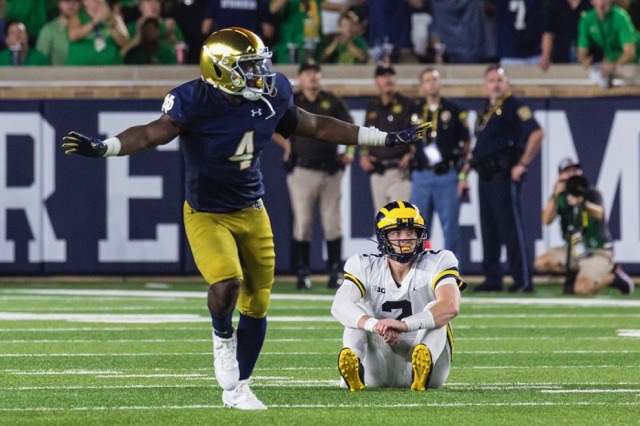 Wimbush snuck right up the middle for 22 yards to extend a drive that ultimately resulted in a 48-yard Notre Dame field goal (which shouldn't have counted because there was a delay of game) that stifled some of the momentum Michigan was building. On the ensuing drive, which started promisingly, Shea's pass was intercepted after being hurried by Te'Von Coney, who set up camp in Michigan's backfield all night. The point is, Michigan had their chances. They were close. It's easy to sit here on a Sunday morning and play the "what if" game, but I'm going to go out on a limb here and say that I think this Michigan team can be an improved team from 2017. I think Shea is the real deal. For the most part, his passes were snappy and right on target all night. He may be one of the most accurate passers Michigan has had in a very long time. Notre Dame was simply just the better team at the start of the game and benefited from some lucky breaks and Michigan mental errors. I get it. As Michigan fans, we're tired of this same old song. I was too after the Outback Bowl. But what I saw out of this team in the second half was something I didn't see much of at all last year. Shea Patterson is the spark that this team so desperately needs. Give him some time. Give the OL some time. I'm telling you, level-headed patient Michigan blog reader guy, this team CAN get there. I'm not saying they will, this schedule is a monster, but they can.